A number of jail staff at Central East Correctional Centre in Lindsay objected to the cages when they were installed. 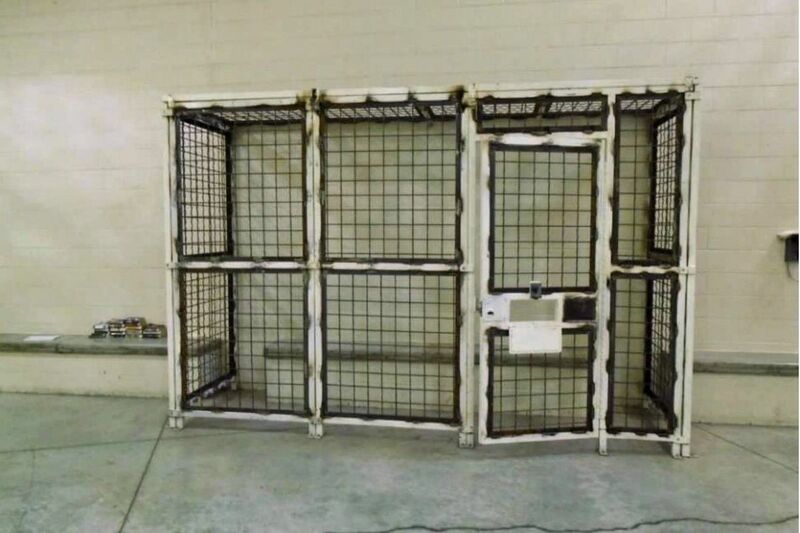 Ontario's independent corrections adviser is calling for the removal of several makeshift pens used in provincial prisons that are similar in size and construction to the notorious "dog kennels" recently dismantled at a federal prison after international condemnation. The cramped enclosures were erected within the past year at Central East Correctional Centre in Lindsay and Central North Correctional Centre in Penetanguishene to create space in recreation yards and day rooms for inmates in solitary confinement and step-down units, which are used to help stabilize troubled inmates before they return to the general population area of a jail. A recent report on correctional reform by independent adviser Howard Sapers includes four photos of recreational space partitioned in such a manner. Mr. Sapers referred to the structures as "troubling" in the report but used more forceful language in a subsequent interview with The Globe and Mail. "A modern jail shouldn't be a resort, but it shouldn't be a dungeon either," he said. "My hope would be that they are removed. They are not suitable for their stated purpose." The austere photos come at a time when Queen's Park is trying to project a more humane image of the way it handles inmates. Over the past year, the Ministry of Community Safety and Correctional Services has issued new entitlements to inmates in solitary confinement, announced the replacement of two troubled jails, promised new legislation for the fall session and hired Mr. Sapers, a former federal prisons ombudsman, to help guide its approach to corrections. But in ushering in a more rights-oriented model, the province says it has reached the architectural limitations of some prisons. Both Central East and Central North were constructed during the "no-frills" approach that prevailed under then-premier Mike Harris and contain limited space for classes, therapy or fresh air. The province acknowledges that building cages to overcome the space crunch is "not always ideal." "Before we came into office, correctional facilities were designed to warehouse inmates rather than rehabilitate," said Yanni Dagonas, a spokesman for Corrections Minister Marie-France Lalonde. "Our government took steps to address this by creating, wherever possible, rehabilitative practices and programming spaces. We recognize the interim measures are not always ideal." Mr. Sapers first saw one of the structures during a tour of Central East. "What are the cages for?" he asked, looking at a telephone-booth-sized pen made of metal mesh and angle iron. A prison administrator giving him a tour of the 1,100-inmate facility took issue with his choice of words. "I was told that these were not cages – they were, in fact, enclosures," Mr. Sapers recalled. Staff eventually informed him the booth was used for one-on-one interviews with segregated inmates. Inside a day room, he found another angle-iron cage, this one for providing life-skill programming to as many as six segregated inmates at a time. Prisoners would sit inside while staff or volunteers delivered lessons from outside the mesh, he was told. "They were built for confidential interviews and programming, but they seem inappropriate for both purposes," Mr. Sapers said. "It's an unacceptable use of that space. If you need a program room, you build a program room. You don't do that with chain-link and angle iron." Staff at the jail tend to agree. When the Central East programming space was welded into place, a number of them objected. "They were installed eight or so months ago, and we said right away that these are not suitable for programming," said Chris Butsch, a correctional officer at Central East and president of the union local. "If inmates are there to speak with addiction counsellors or something, that should be a confidential conversation. What kind of serious work can you do if someone feels they can't openly talk?" Mr. Butsch says the programming cage is rarely used now except for monitoring methadone patients. Mr. Sapers's report also contains two photos from a step-down unit at Central North. One shows the recreation yard within the step-down unit divided into four pens. Each measures about 31/2 by eight metres, according to the ministry. "It's a large dog kennel is what it is," said Chris Jackel, vice-chair of the correctional union's employee relations committee and an officer at Central North. "The approach they took in building these things is quick and slapped together." The other Central North photo comes from a day room within the step-down unit that has been diced into three separate areas. Mr. Dagonas openly disclosed that three other provincial facilities have comparable cages – what the ministry calls "short-term security cells." Hamilton-Wentworth Detention Centre contains such a space, where inmates in solitary can receive "counselling and spiritual advice." Segregated inmates at North Bay Jail use the telephone in similar confines. And a medical waiting area at Kenora Jail also qualifies as a short-term security cell, Mr. Dagonas said, but it's slated for removal. In August, new federal prisons ombudsman Ivan Zinger told The Globe he wanted the Correctional Service Canada to remove Edmonton Institution's "dog runs," the outdoor metal cages where inmates in solitary confinement spent their daily exercise time. One inmate said they measured roughly 11/2 by four metres – about half the size of the Central North pens. Days after The Globe published his comments, the structures were dismantled. Mr. Sapers has recommended that the ministry audit its program spaces to ensure they're appropriate. The ministry has vowed to "address" all 125 recommendations Mr. Sapers has made over the course of two reports.